Orlando, Fla. – The Grand Rapids, Michigan coverage of the 2013 MasterCraft Pro Wakeboard Tour presented by Rockstar, originally set to air on NBC Sports Network today at 3:30pm has been moved to Oct. 14 and will air at the same time. The programming change has been made to accommodate the live broadcast of the 2013 America’s Cup. The Oct. 14 broadcast of the MasterCraft Pro Wakeboard Tour Grand Rapids will still be available in approximately 78 million homes. The event was the final competition on the 2013 Pro Tour season as well as the 2013 King of Wake series. Tune in to follow wakeboarding’s top pro riders, as they compete in the sport’s most elite competition series for big prize money and to determine who is the King of Wake. NBC Sports Network gives viewers unprecedented access to the competition with in-depth profiles of all the top riders. 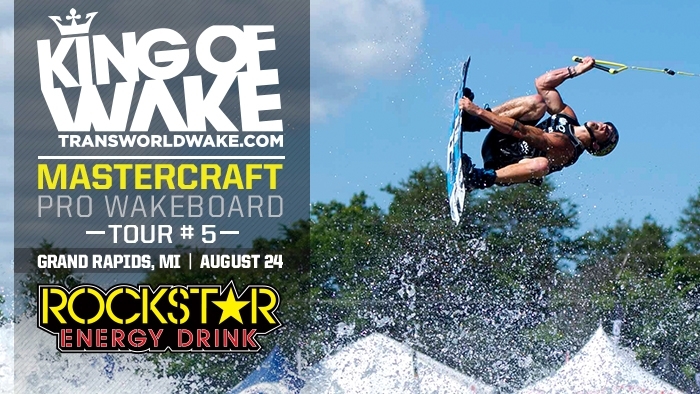 For more information visit http://www.kingofwake.com. The MasterCraft Pro Wakeboard Tour presented by RockStar is organized by World Sports & Marketing of Orlando, Fla., and has the support of the following sponsors: MasterCraft, Rockstar Energy Drink, WWA, Overton’s, Indmar, Polaroid Action, Ronix, Billabong, Zeal Optics, CWB, Hyperlite, Liquid Force, Byerly, Peavey, Sayiwon’t, Epiphone and TransWorld WAKEBOARDING magazine.